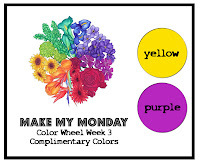 Welcome to the fifth and final week of the Make My Monday colour wheel challenges. This week we're focusing on a trio of colours known as SPLIT COMPLIMENTARY COLOURS. Split complimentary colours are fun to play with. You start with one colour, find its compliment and instead of using the compliment, use the two colours beside the compliment. Mynnette has chosen the split complimentary colour scheme of fuscia, green, and yellow for you to create with this week. White and cream are your acceptable neutrals again! You may stamp lined images and sentiments in either black or brown, but solid images should be stamped in fuscia, green, and/or yellow. We at Make My Monday, have come to the last of Mynnette's colour challenges, I haven't found these challenges to be easy, but I have greatly enjoyed them. Some challenges are more challenging than others, but those are the ones I learn something from, so thanks Mynnette, for taking me out of my comfort zone, it has been fun. This the last week has been even more challenging, however, once I popped onto Less Is More and saw their Sketch theme for this week I knew immediately how to use the colours. 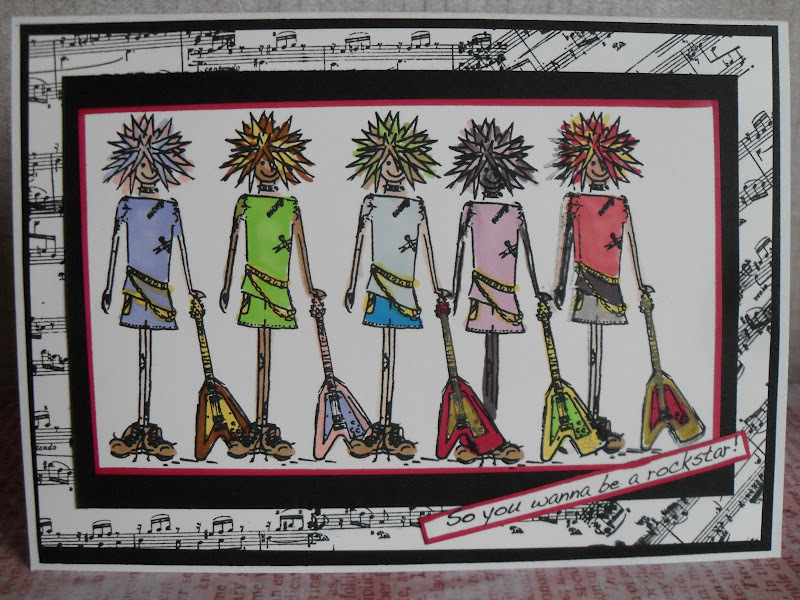 I am also entering this card into the Less Is More challenge, please note the above girls, not my normal colours, but different and fun to do. I would like to say a personal farewell to Suzanne B who has recently left the DT team, you will be missed but I am happy to know we will be meeting each other around blogland. We, Jacqueline the owner and the DT have decided to take the month of August as a Summer recess. This current challenge will last until we return, all entries will be commented upon and the winners will be announced on our return 6th September. I do hope we in the UK have a better remaining summer with some sun. Sorry this entry is so long, so much to say. 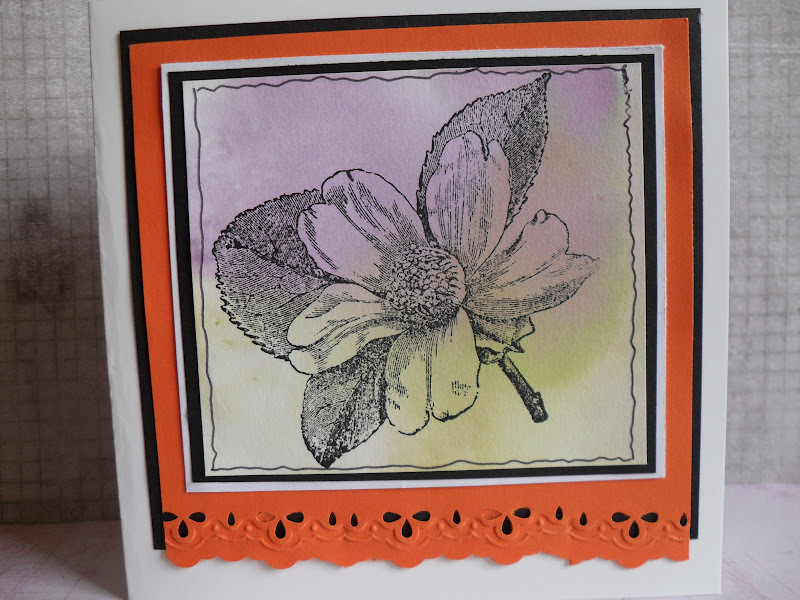 Stamps used - small flowers from Dreamees. This week at CD Sunday Challenges it is the turn for Wendy P's choice of theme and she has chosen Mainly For men. A card for a man or about men. I choose an image from Marie G Designs International CD - Just 4 Men, which I purchased a few years ago on E Bay. 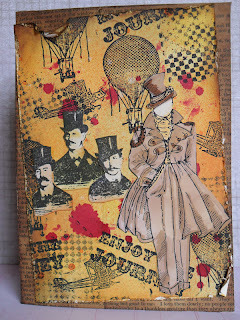 I coloured the main card with Vintage Photo DI, and stamped with a Travel set of stamps from Debbie Moore. 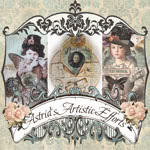 I look forward to visiting your blogs once again, for you ladies always have some stunning and imaginative cards to view. 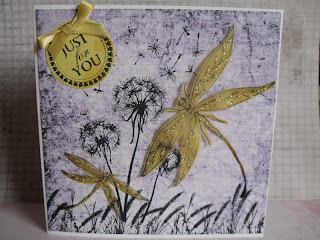 Please do pop over to the main blog for the Design Team have created some fabulous inspirational cards. Remember you need only use one small element from a CD or you can create a complete card from a CD. We are up to the letter M already at the Alphabet Challenge, the choice for the next two weeks is Men, a card with a Man or for a Man. Over the past few weeks for my class I have been making a number of distressed cards with some men, so felt maybe it was time to have a change. 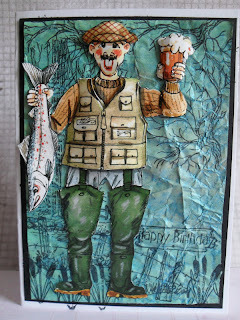 how more different with a Flippen Men decoupage sheet from La Pashe, I do find this series of Men to be very useful. 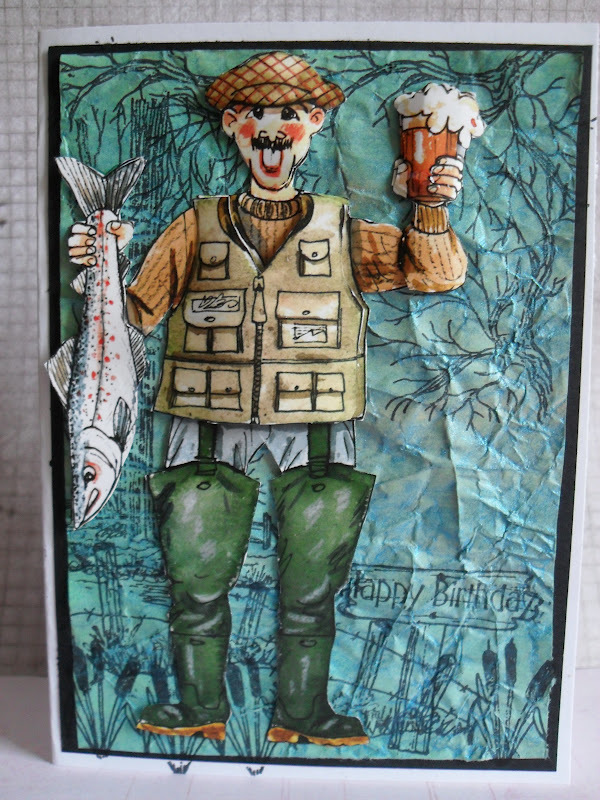 I realise not everyone's cup of tea, it is an acquired taste, here is my Fisherman. The background was originally a piece of copy paper, coloured with Starburst Stains from The Stampman. I then stamped some images from the Flippen Men set and from a BarjanB set of country stamps. 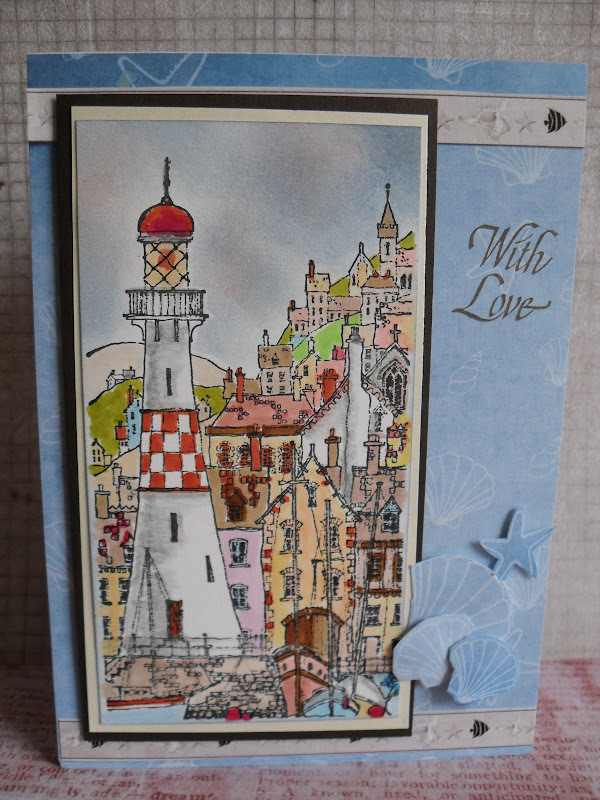 I loved your Lace cards last fortnight everyone, and am again looking forward to seeing your men's cards. Some do say the most difficult to make, but we know you ladies (and any crafting guys out there) come on you can do it. Time for the guys to be distressed in a Steampunk setting. I am entering this card into two challenges. 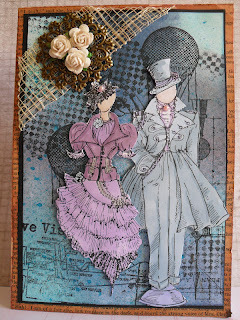 Over at That Craft Place held on Sundays - for Steampunk and at Allsorts a Saturday challenge with Distressing as their theme. Thanks to both for great inspirational cards and interesting challenges. Old book pages cover the main card and were coloured with Vintage Photo DI. 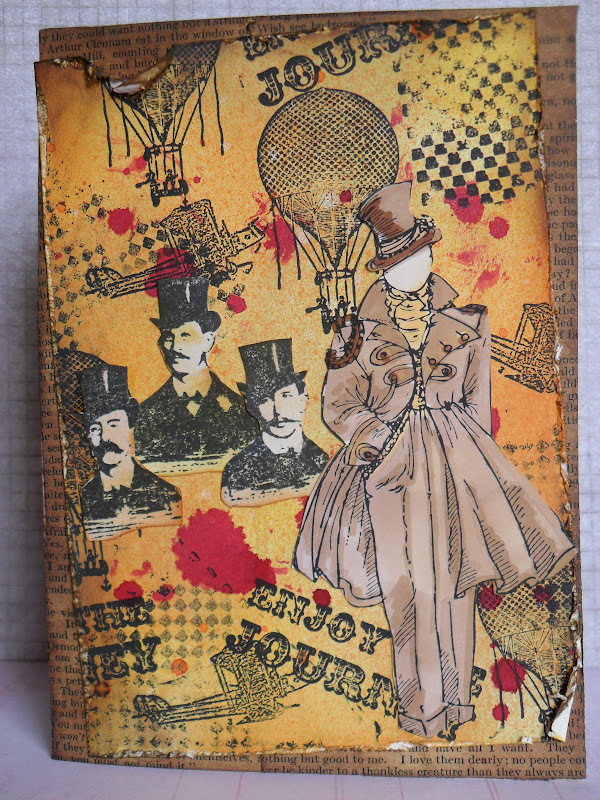 A white piece of card was coloured with several Distress Inks, splattered with Cosmic Shimmer red spray, The background stamps are from a Creative Expressions set - Flight - the men in black are from Tim Holtz , the other gentleman is from Kanban - Jasper set. May I take this opportunity to thank my recent new six followers, I am thrilled to see you and hope I can continue to provide an interest for you. 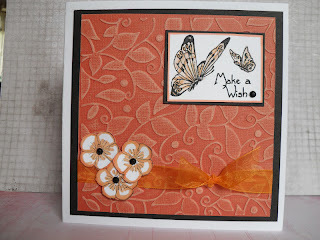 Over at Sweet Stampin, they are having a challenge for Monochrome this week. 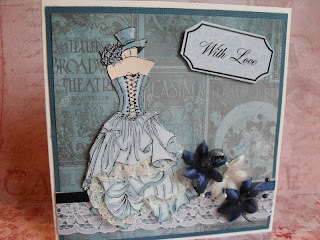 this is one of the cards from my production line which I mentioned in the post before this, please check it out. I used papers from Papermania the Aqua set. 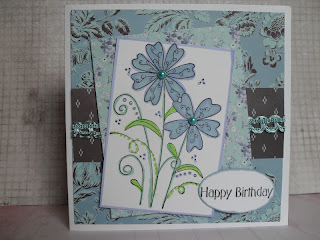 The stamp is from Kay Carley - Funky Flowers available from The Stampman. I coloured the flowers with Promarkers. thanks for the challenge ladies, I always enjoy making Monochrome cards. My Post Problem is Back AGAIN! On Friday I entered two new posts, one to be published today, Sunday and one for tomorrow. Since I entered them both, I have not been able to access my Pages. When I click on Draft - I got a message which told me it was an error to refer to bx-10x30o . I have had to re-do my new post for today and presume I will have to again tomorrow. I am off to Blogger support to see if I can find out what the ....is going on..So, if there is an identified problem to have a code, is it just me? I doubt it. Check to see if your posts are there my blogger friends. I've listed my problem but no help whatsoever!!!!! 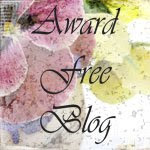 Tuesday - 10th July -UP-DATE - I did report the problem of having no access to my POSTS to Blogger Forum, so I don't know if the problem has been resolved by them or not but I am THRILLED to report I have back my list of POSTS. Thank you to whoever or whatever - I am once again a HAPPY BLOGGER. Monday - 23rd July - Oh! No! The problem is back again. 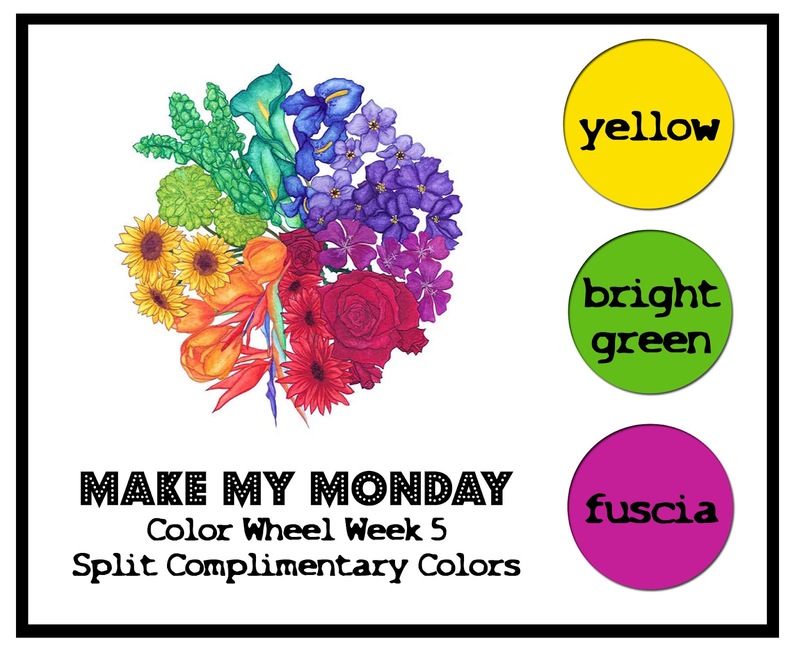 We're back in a fourth week at Make My Monday with a focus on the color wheel! This week our main focus is on ANALOGOUS COLOURS, which are colours that sit in a group of three next to each other on the colour wheel. We usually use these combinations when doing monochromatic artwork. This week we are focusing on blues and Mynnette would like to see creations using turquoise, light blue, and dark blue with white or cream as your neutrals. You may stamp lined images and sentiments in either black or brown, but solid images should be stamped in one of the three blues. Here is my card, which this week I have kept clean and simple. 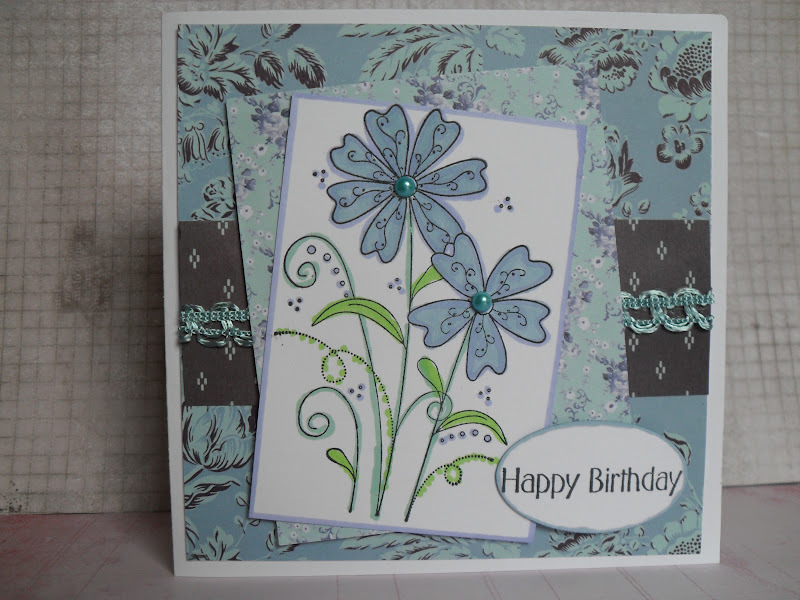 I used an embossed edge C6 card and matted and layered in the chosen colours the stamped image. The stamp is one of my bargain favourites, an old wooden stamp, maker unknown, marked down from £9 to £2. Each of the 3 sections are one stamp. I covered the last two sections on the stamp with Sellotape, inked the first section. Removed the tape from the second section, carefully inked that section, removed the tape from the last section and inked that. Then one great big huff and blow to re-moisten and stamp. I added two small slits in the card to thread through the ribbon, tied in a knot. I again, look forward to visiting your blogs to see your creations. Last week's were amazing, so many wonderful cards, I found it extremely difficult to choose the top 3. ..................whatever you want it to be this week at CD Sunday Challenges Blog. 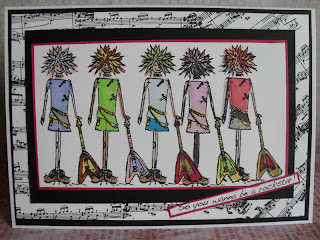 Wendy M chose this week's challenge of A is for........The design team have such an eclectic mix of themes beginning with the letter A, some wonderful cards to inspire you. Though of course, we are interested in what you will create and look forward to visiting you once again. Remember, you must include something or everything, it's up to you from a CD. I chose A is for Africa. This is my card, I didn't need to add much to this for I feel the image itself is so stunning it needed little to enhance it. I added a rolled piece of twine and made some paper beads to hang from it as an African embellishment, along with a piece of animal ribbon a friend gave me ages ago. This is my third entry today, I would love for you to check out my two previous entries, similar and yet greatly different from this entry. 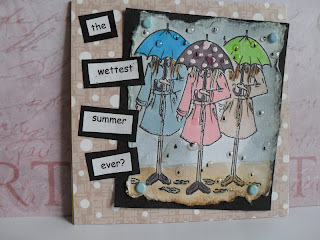 Over at Fashionable Stamping challenges this is their second week for the challenge, Let's Get Inky and Messy. I had a session of getting messy and inky twice this week. First, preparing for my class on Friday and second was at the class, which was , Distress - How Far to go? The card below is quite distressed, by ripping, tearing, crunching, blending Distress inks, spraying water then spritzing with Cosmic Shimmers, the mica effect doesn't show as well as in real life. I also stamped a few clocks and cogs to the background. The couple are from my most used set of stamps at the moment, from Kanban - Jasper set. they have been coloured with Promarkers, trying to use colours from the background. 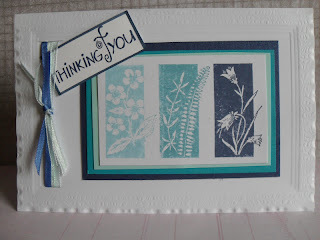 I'm missing being with all of the girls at FSC, but your all doing a wonderful job, as usual and good luck with your DT Call and for your NEW adventure - VINTAGE STAMPING CHALLENGE sister blog. I look forward to it's inauguration. 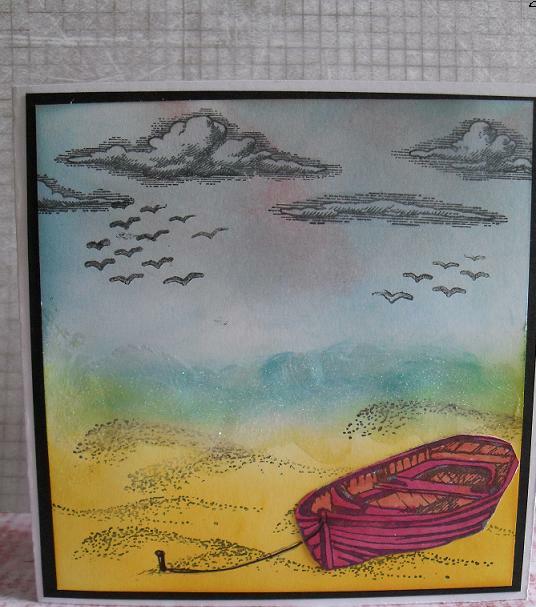 This card is the second one I made for my class this week Distress - How Far to go? Please see the one above and below. I found a lovely site called Chocolate, Coffee and Cards, a perfect combination for any crafter, whose challenge is Steampunk and Metal, perfect for this card. 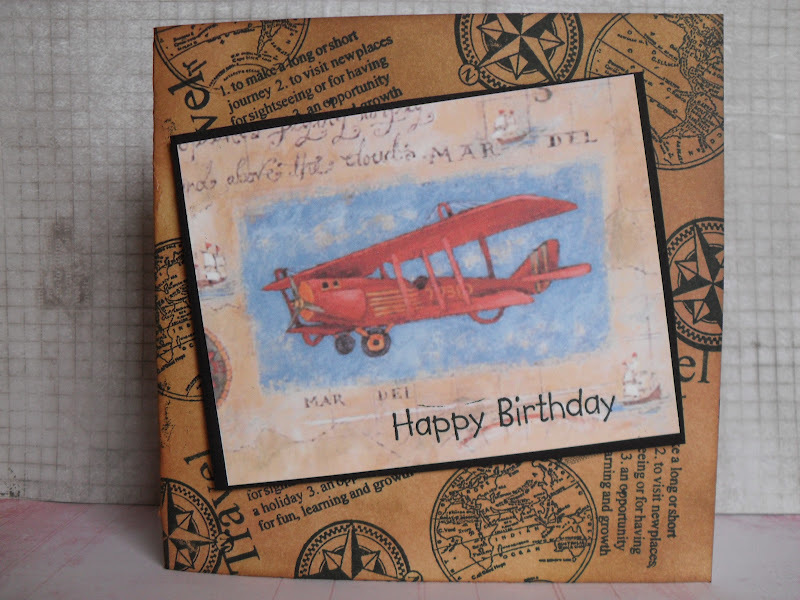 The background is stamped with Flight inventions - Creative Expressions. I have included some mesh and a metal charm with flowers. 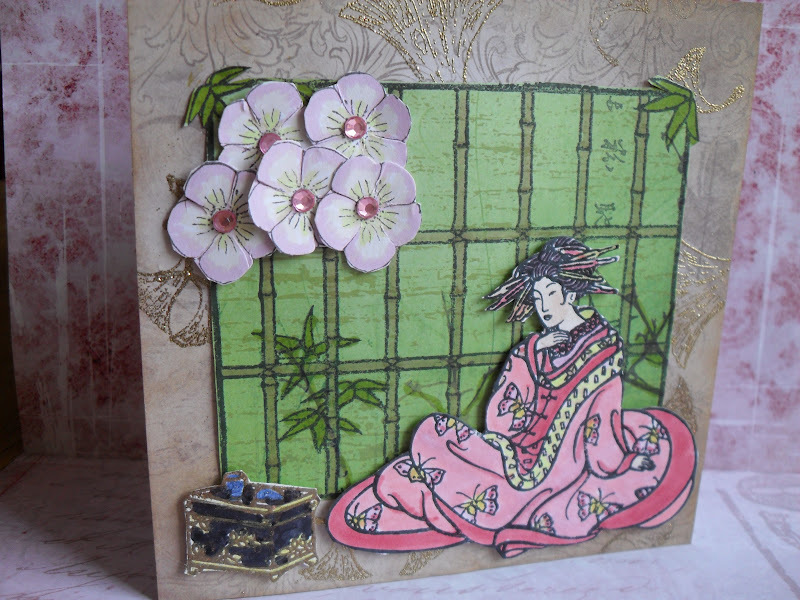 The couple are from Kanban stamps - Jasper set, I coloured with Promarkers. They are of a Steampunk age. Thanks for the challenge girls. 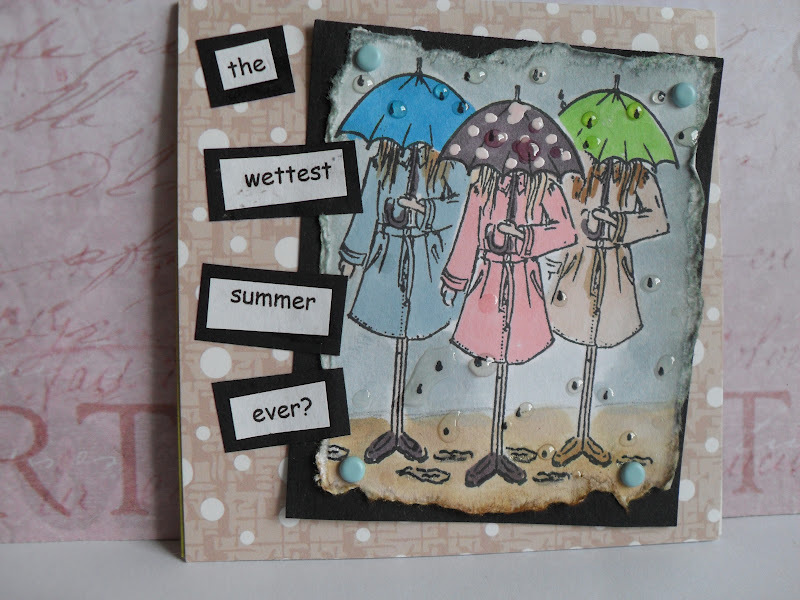 I'll be honest, usually I look for a challenge then make a card for it, but this week, I made three cards for my class which I decided to enter into challenges, the theme for the class was Distressing- How far to go? 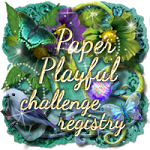 So, for a change, when I went to Feline Playful to check on the current challenges, I was pleased to find there were three suitable challenges to enter my three cards into. 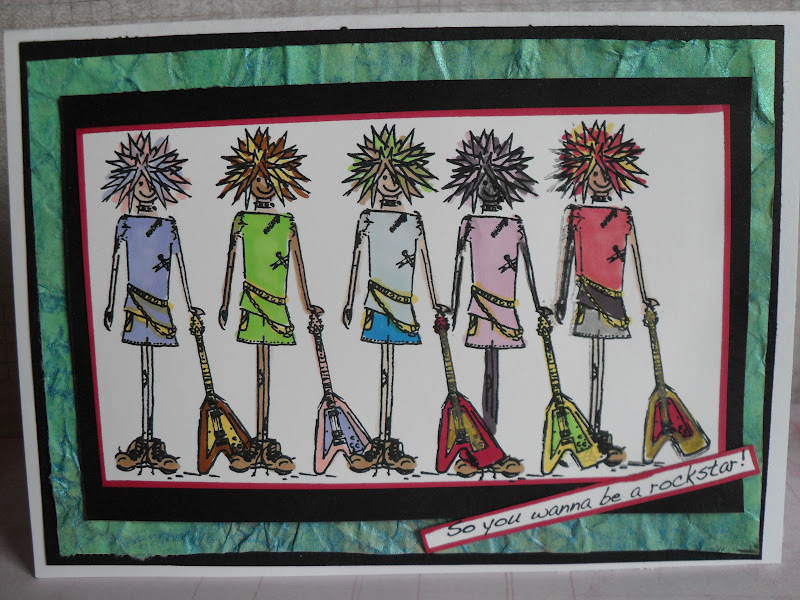 Starting with Card 1 - I am entering into Southern Girls Challenge #49 Angels or Fantasy, mine fits into the Fantasy. 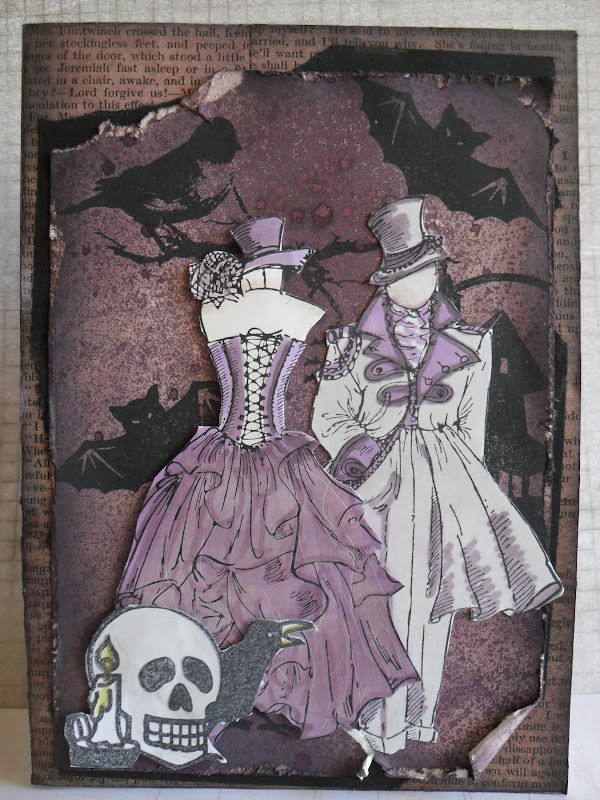 When I was making my cards each one got more distressed than the previous, this one made it as far as I think I could go, with a Gothic theme. Pages torn from an old book provided the final background, distressed with Dusty Concord and Black Soot. 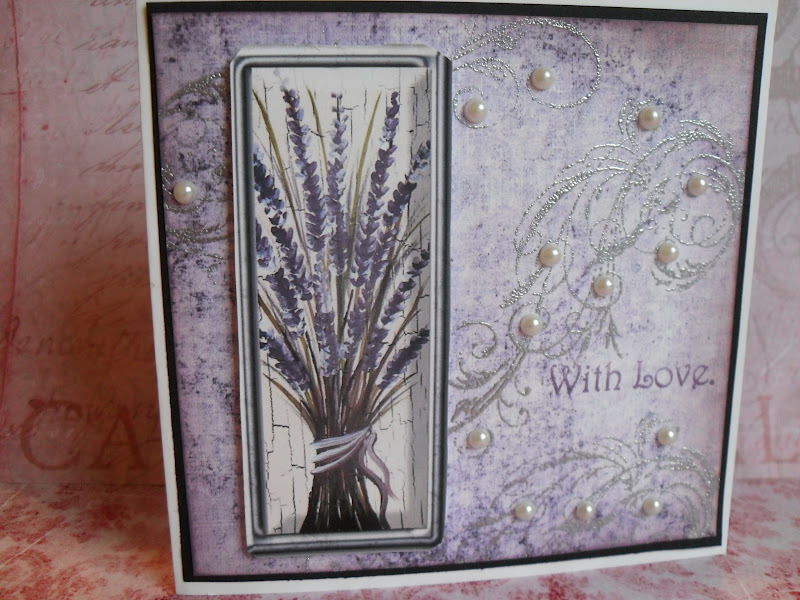 A torn black piece of paper, the main background card started out white, I blended several Distress inks, the main being Dusty Concord, it was spritzed with Sprinky's Amethyst from Inkylicious. 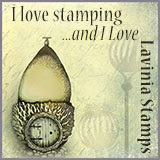 Stamped with Gothic type stamps from Tandastamps. The main images as on all of the 3 cards, are from Kanban - Jasper set, coloured with Promarkers. I hope you like my gothic version of a distressed card. Hello again! 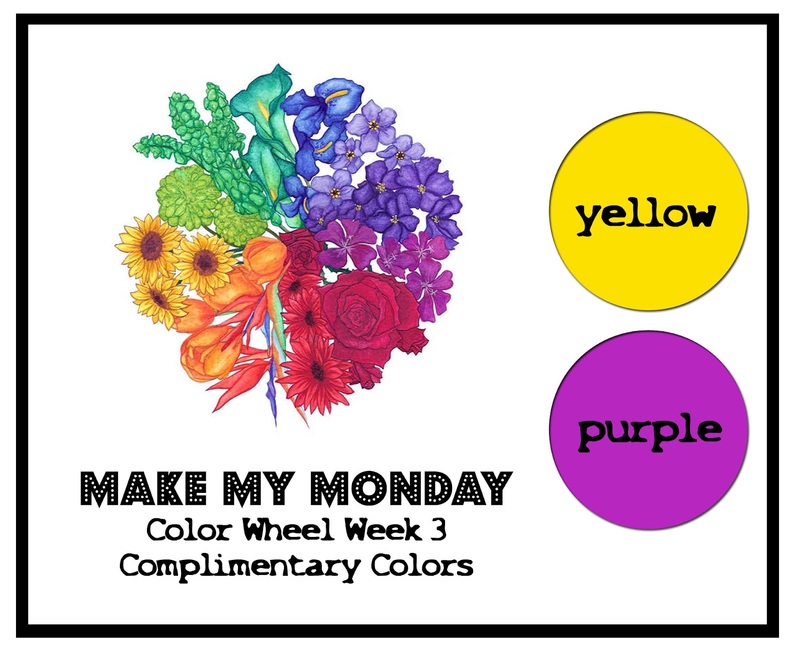 Welcome to week three in the Make My Monday colour wheel challenges! This week we are focusing on COMPLIMENTARY COLOURS, with a chosen colour pair to work with. Complimentary colours are colours that compliment each other. They fall across from each other on the colour wheel. Since purple and yellow are Mynnette's favorite colours and are complimentary, she'd like to see some creations using just these two colours plus white or cream. You may stamp lined images and sentiments in either black or brown, but solid images should be stamped in yellow and/or purple. Please pop over to the main blog to check out the DT samples and from our guest for the month buttons, there are some amazing card projects, though you can enter any form of paper craft project you wish. Here is my card. 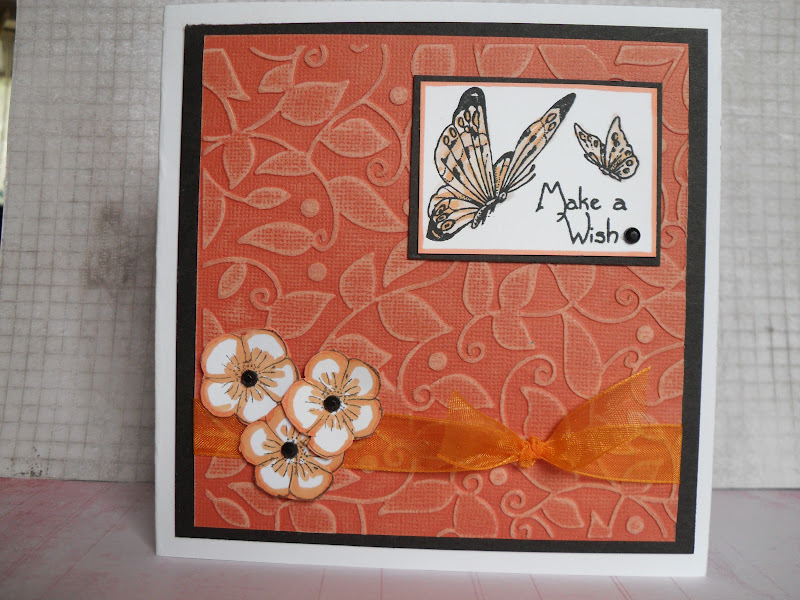 The background is from Sheena Douglas Cd Paint Fusion. I stamped the fine line stamps of foliage with black ink. Stamped with Stazon onto yellow vellum, then added yellow litter to the wings, thorax and tails of the dragonflies. 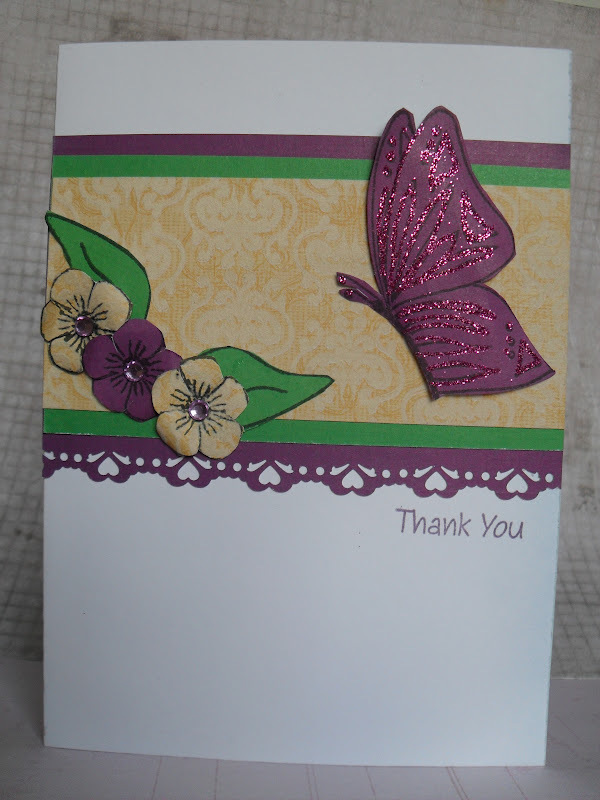 Stamped onto yellow paper and punched out the greeting and added a yellow bow. These are not two colours I would have put together, yet, I was pleasantly surprised on how well they look, so thanks Mynette, for once again, it has been proven this is another reason why we try to offer you different forms of challenges. 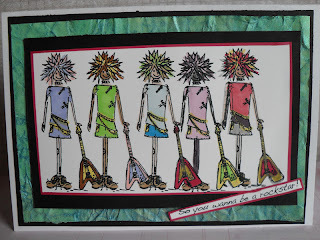 I look forward once again to visiting your blogs, may I compliment those who have been venturing along with us during Mynette's colour challenges, not as easy as most but a very enjoyable challenge, maybe you have to use more little grey cells but for me, the more I use, the less I loose. 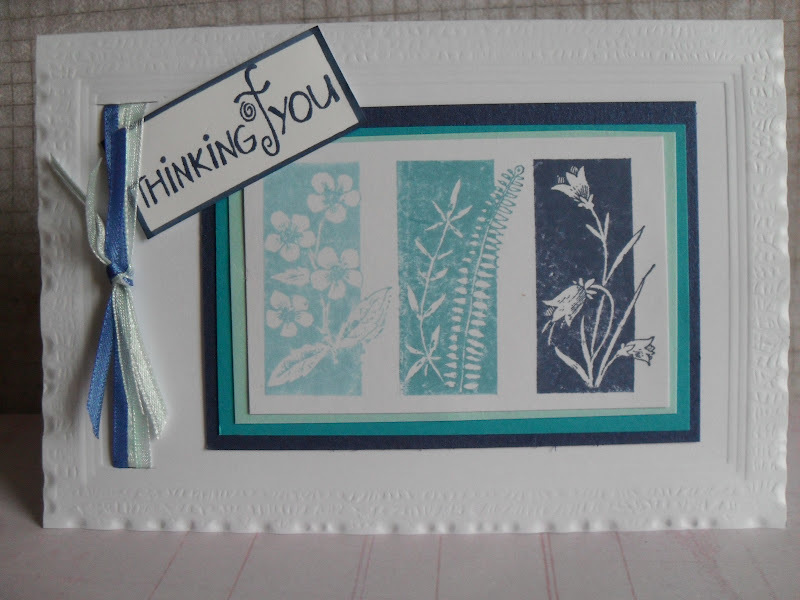 Stamps - Dandelion and Grasses- Indigo Blu - Dragonflies - Non Sequitur - Oriental Collage Elements from The Stampman. Is it just me - Blogger problem-AGAIN! One 5.75" square card, a sheet of black paper to mat the background paper. Background paper from Distressed paper on Sheena Douglas CD - Paint Fusion. Lavender image from same CD. 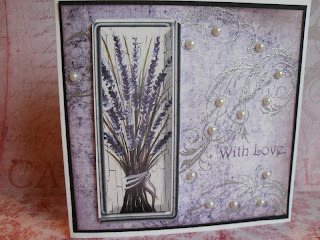 Swirl stamp - a favourite of mine from La Blanche stamps with added pearls. I look forward to visiting your blogs to see your wonderful creations. It was so nice to see some regular and some new entries last week, it would be nice to visit a few more once again. L is for Lace over at Alphabet Challenge for the next two weeks. An opportunity to be really feminine or even raunchy if you feel like it. Please pop over to the blog, for the design team have produced some wonderful varied samples to inspire you. 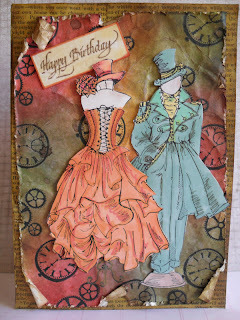 I used a Kanban stamp of a Steampunk lady, but it doesn't have to be in a steampunk setting as I show above. I decoupaged the dress with layers of narrow lace. I look forward to visiting your blogs to see how you have introduced lace, whether it be real, faux, stamped, paper or even punched or what about doilies with their lacy patterns? Over to you. Stamp Kanban - Jasper Steampunk set. Purple,Green and Orange. At first, I again didn't find this easy, but isn't that what challenges are all about, for us to try something fresh or completely different? I had recently used the water-colour block technique at one of my classes and thought it would fit in well with this challenge. I may have chickened out a little by not actually including the orange in the design but I did use it as a matted layer, so I am hoping this is okay with Mynette. The water-colour block technique is so simple and yet I believe so effective. First choose your stamp, any medium, fine line art. Then choose an acrylic block an approximate size of the stamp, it is not needed for the stamp. Choose two or three colours of Distress Inks, and pat onto the block in the same areas you want your colours to match the stamp. 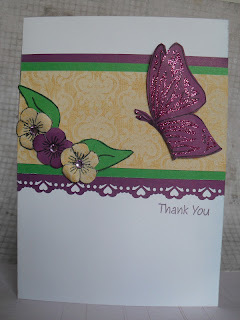 Apply at least 3 sprays of water to the block, press onto a piece of card. Gently lift off, allow to air dry. When dry, using black ink, stamp the image. When dry, cut off excess card. I drew a wiggly line around the edges. Mat onto suitable card and finish as you choose. I look forward to visiting your blogs once again, we do visit everyone, to help us choose our Top 3. 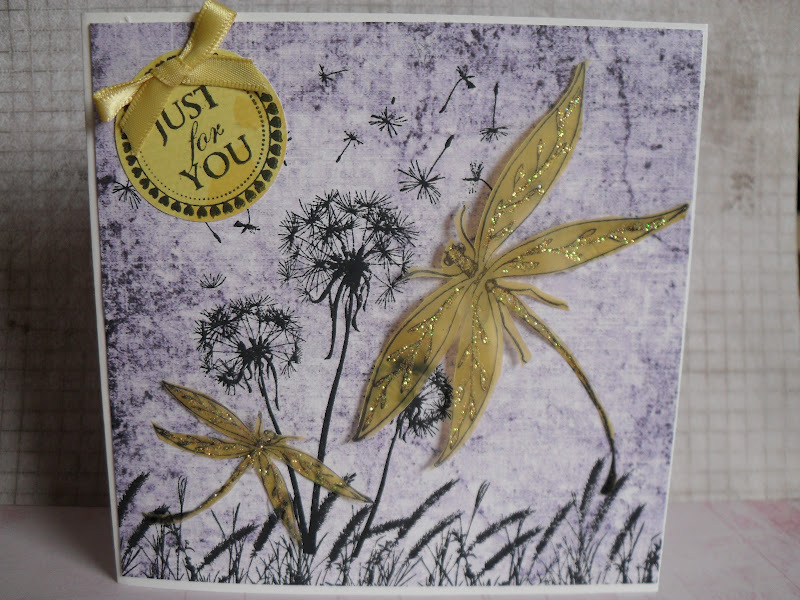 The DT and our guest Buttons have again made some fabulous cards to give you inspiration. Since I joined CD Sunday's DT this is my first choice for the weekly topic - Best of British-. so many ideas to choose from, so many British events have recently taken place, showing how well we can put on a show. 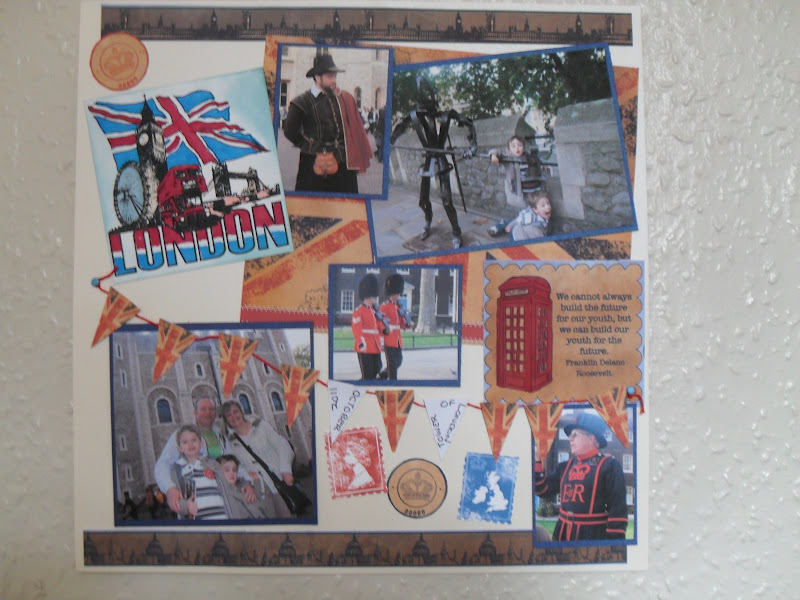 I had some photos sat in my 'Pictures' since last October of when my son and his family visited London. Along with papers and some embellishments from the Debbie Moore shabby Chic - London CD, I created this LO for a scrapbook.. At the top left corner is a stamp from Stampendous coloured with Promarkers. Please visit the main blog, for the team have made some wonderful examples to inspire you, which show the Best of Britain. I do hope you enjoy this theme. I look forward to visiting your blogs once again. You Wanna Be a Rockstar! When I look at challenges I usually think, Yes, I'll enter that one, then life and other craft commitments take up my time and I many a time miss entering. 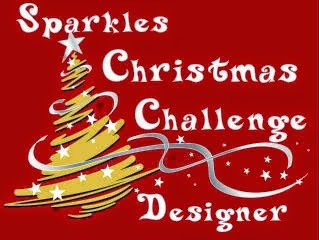 Today when looking at the Challenge Blogs I found one I immediately wanted to do, set to and this is the result. The stamped image also fits nicely into another challenge but needed to be adjusted to make a card using only one stamp at Scrapbook Sisters card week - One Stamp. I added the image onto a sheet of background paper which I made in one of my messy inky sessions with Starburst Stains from The Stampman. Aren't the months going by quickly? 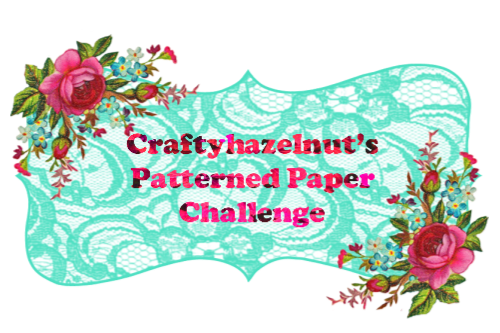 It is time again for our monthly swap of Fat Pages at Do Crafts. the theme for June has been Water, how appropriate! I received some fabulous ideas of water, many were so different. the amount of rain we have recently had in the North of England has been unbelievable, which is why I decided to make my Fat Page with rain in mind. 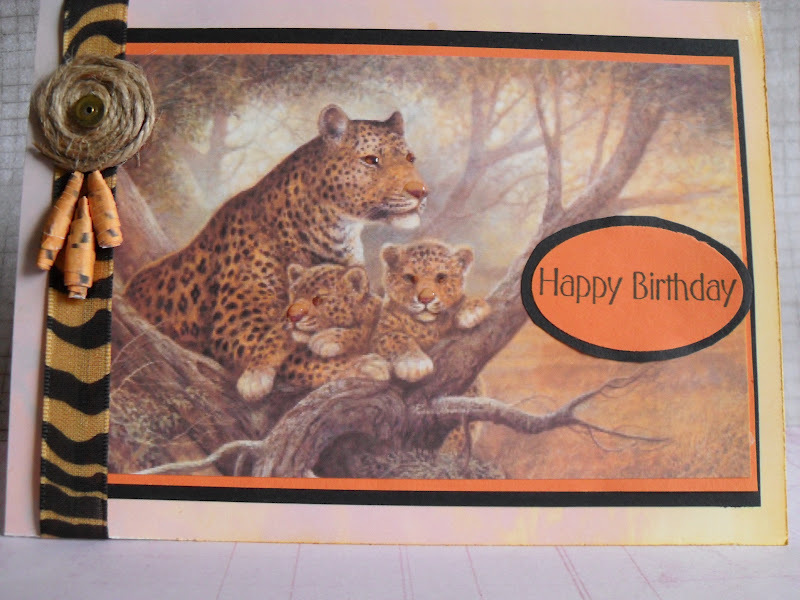 I choose a spotty background card. I then stamped my middle lady with the brolly, masked her and stamped the remaining two ladies. Coloured them with Romarkers and where I could I added Glossy Accents to provide raindrops, I think you'll see them if you click on the picture and enlarge. the background is water coloured Distress Inks. Stamps used - Set of Girls from Debbie Moore. 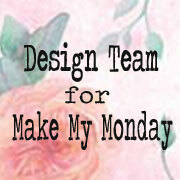 Hi, we have a new Monthly theme starting this week here at Make My Monday. All month long, our hostess, Mynnette, would like to focus on colour by using the colour wheel. For our first week, we'll be focused on PRIMARY COLOURS. Primary colours are colours that cannot be created using other colours, but instead are used to create the many colours we have in our world. This week we'd like to see creations using the three primary colours: RED, YELLOW AND BLUE. White or cream are the neutrals that are allowed in this challenge. You may stamp lined images and sentiments in either black or brown, but solid images should be stamped in primary colours. Check out the wonderful examples from the Design Team and welcome to our GTD Buttons this month. Sand markings and the boat Creative Expressions - Coast set. I look forward to vising your blogs to see your Red, Yellow, and Blue creations over the next week. Doesn't time fly. Here we are Sunday again already. For this week at CD Sunday Challenges we would like to see a project which has used something from a Craft CD. Lots of choice out there. 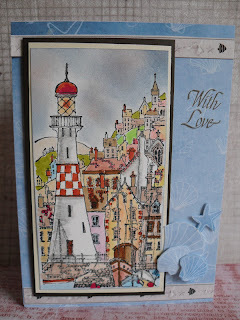 Our theme this week is Seaside Treasures. The DT have made some fantastic cards, please do pop over to see them and hopefully you will be inspired to join us in our challenge. For the background of my card I used some lovely blue backing paper covered in pretty shells, the ribbon strips and some additional shells which I cut from the paper - all from Debbie Moore Shabby Chic - Travel CD. 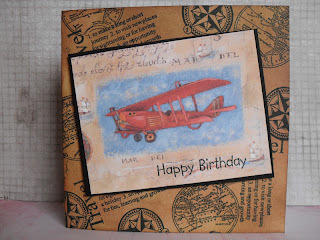 The main image is a stamp from Michael Powell, from Do Crafts. I used Promarkers to colour this in and found it so relaxing. I used Distress Inks to blend the sky. I look forward once again in visiting your blogs to see your Seaside Treasures. 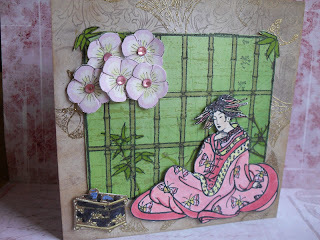 Over on Fashionable Stamping Challenges our theme for the next two weeks is Oriental. It's not as popular as it once was but like everything else it will make a come back I used a Non Sequitor sheet of stamps available from The Stampman and coloured with Promarkers, with a little Heat embossing on the small box. The small flowers are from one stamp from www.dreamees.org.uk a recent favourite purchase. I look forward to once again visiting you for I'm sure we can look forward to some stunning creations. please be sure to pop over to the main blog for the DT have visited the Orient in true fashion and style.